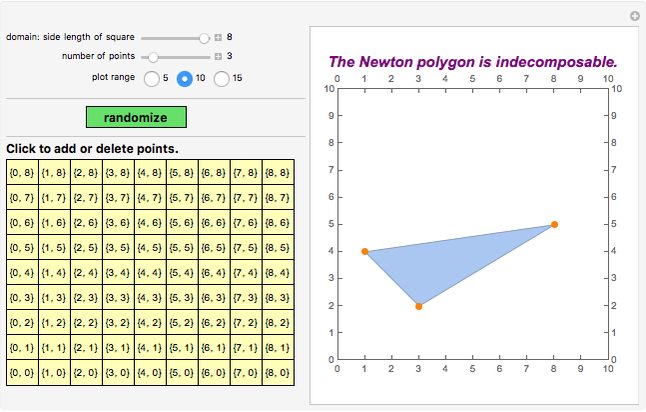 Consider a Newton polygon for a set of points in the plane with convex hull . The construction of the polygon is slightly different from the traditional one as follows (which is why some use the term Newton polytope). The point is associated with the monomial , and a set of points in the plane is associated with the polynomial , that is, the sum of the monomials corresponding to the points in the set. For example, is associated with . Note that coefficients do not matter. A polynomial that can be factored into a product of polynomials of lower degree is called reducible. The Newton polygon of a reducible polynomial corresponds to the Minkowski sum of the Newton polygons of the factors of . 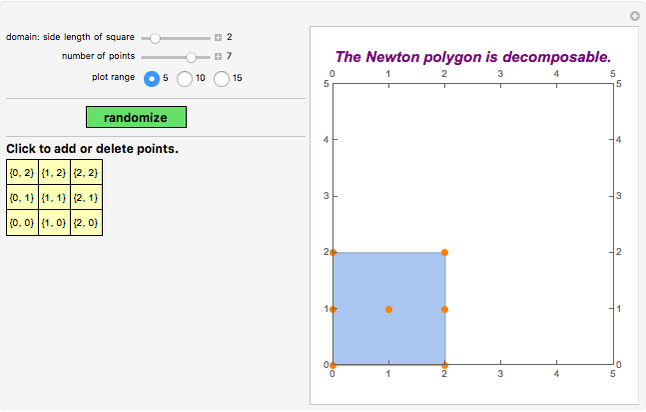 If a Newton polygon corresponds to a reducible polynomial, then is called decomposable. In this Demonstration, a random set of points is chosen inside the square of side length from 1 to 8. The program checks if the corresponding Newton polygon is decomposable or indecomposable by checking all possible decompositions based on the boundary of the polygon; in the latter case, the corresponding polynomial is irreducible over any field, that is, absolutely (or geometrically) irreducible. S. Gao and A. G. B. Lauder, "Decomposition of Polytopes and Polynomials," Discrete and Computational Geometry, 26(1), 2001 pp. 89–104. doi:10.1007/s00454-001-0024-0. 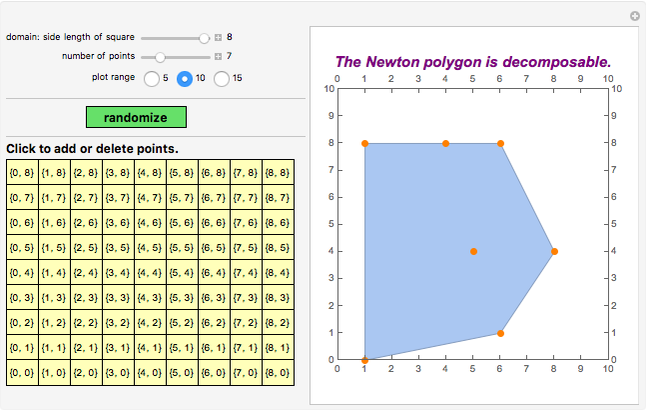 Kevin Choi "Decomposing a Random Newton Polygon"
Is a Point Inside or Outside a Regular Polygon?